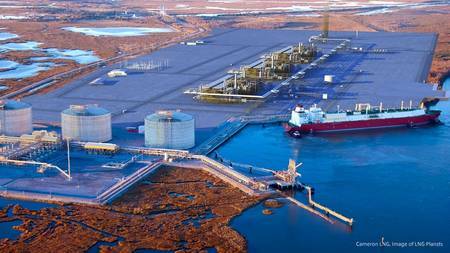 Sempra Energy announced that Cameron LNG has initiated the commissioning process for the support facilities and first liquefaction train of Phase 1 of its Hackberry, La., liquefaction-export project. Cameron LNG export terminal. Pic: Mitsui & Co., Ltd.
"All major construction activities have been completed to begin the commissioning and start-up process to produce LNG from the first liquefaction train," said Joseph A. Householder, president and chief operating officer of Sempra Energy. "This is a significant milestone for this landmark U.S. energy infrastructure facility – an important step forward in advancing our strategic vision to become North America's premier energy infrastructure company," Joseph added. Once all of the steps of the commissioning process are approved by the Federal Energy Regulatory Commission (FERC) and successfully completed for the first liquefaction train, LNG production will start up, and then ramp up to full production for delivery to global markets.